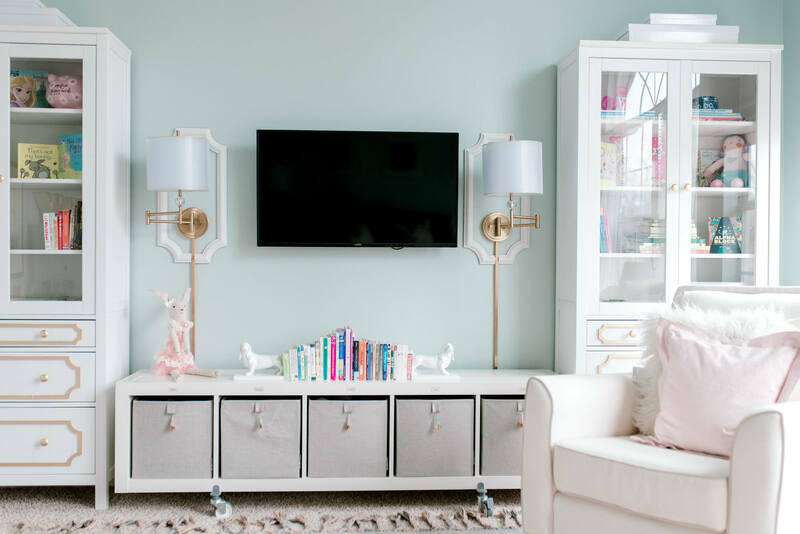 Whohoooo for finally pulling together a room playroom reveal!!!! We’ve been in our home in Dallas for nearly a year and I finally feel like this house has come together piece by piece. Most rooms are 90% done , but honestly the decor has taken a bit of back seat as we try to get settled with school, work, etc. When we were looking at homes, this one stood out because there was a dedicated playroom/media space upstairs. It wasn’t too big and was just cozy enough to make a fantastic playroom + lounging area for the family. As we moved in, it was the first space to take priority to make functional. The girls desperately needed space that they could own, and also one where we could spend time together as a family. We took it step by step and enlisted the help of Katrina over at Operation Organization to help us make thoughtful and purposeful organization decisions. 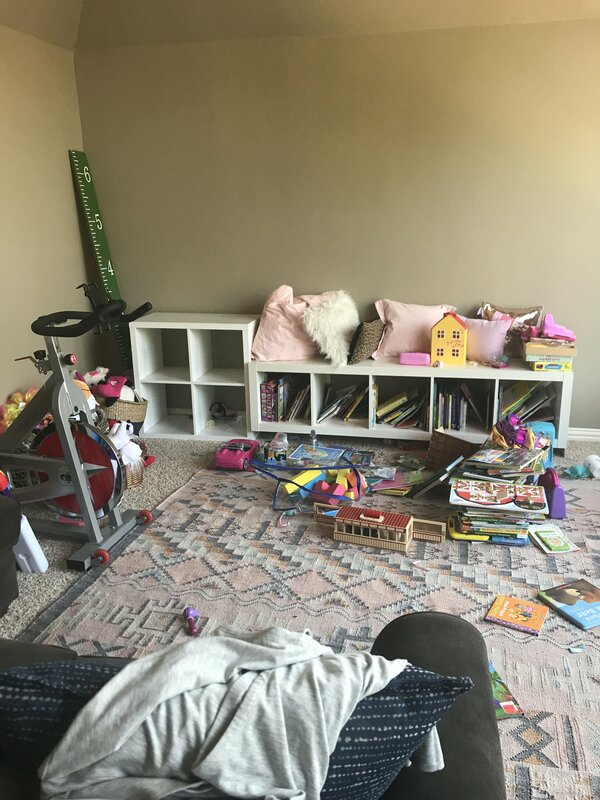 Looking back at how functional the space is day to day for us, I can tell you that it’s made all of the difference, especially in a room like the playroom. 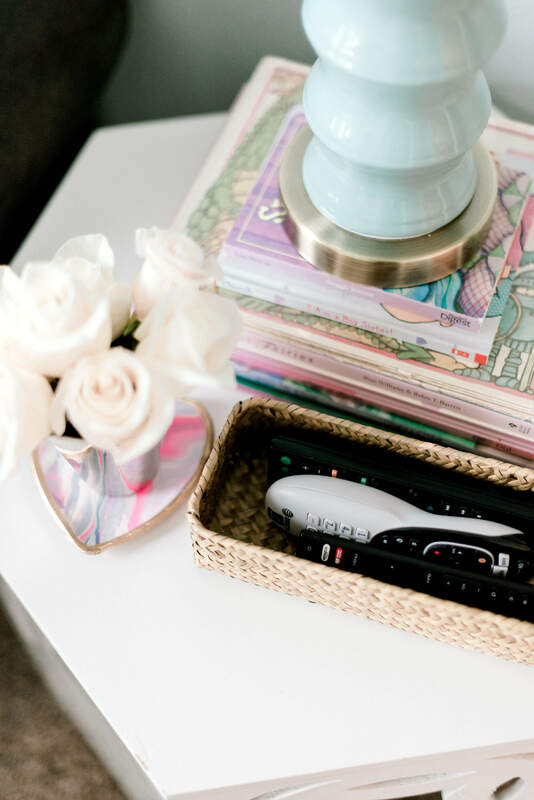 In this post I’m sharing all of the decor details (sourced all together at the end of the post), plus some valuable tips, tricks and advice from Katrina on how to thoughtfully work through and organize a space like this. I hope that you enjoy! 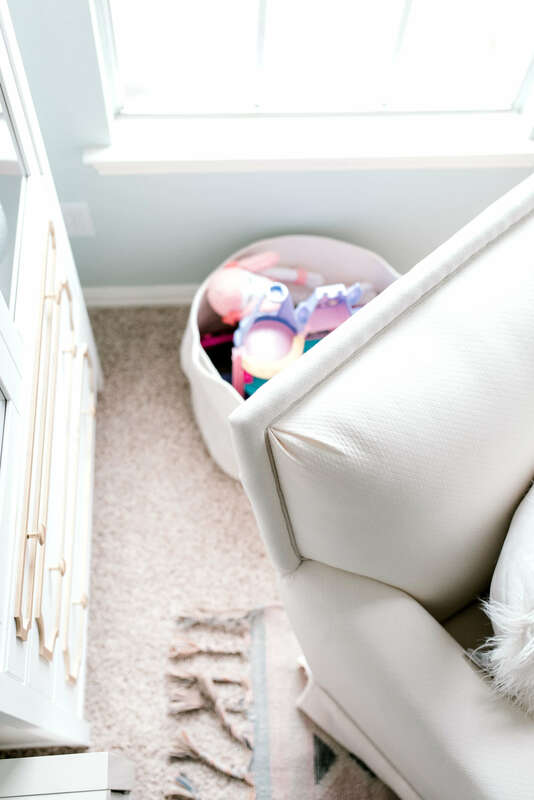 Style Your Senses | Playroom Reveal! To give you a visual the photo above is the angle entering from the door and is a view of how the room looks as you walk in. 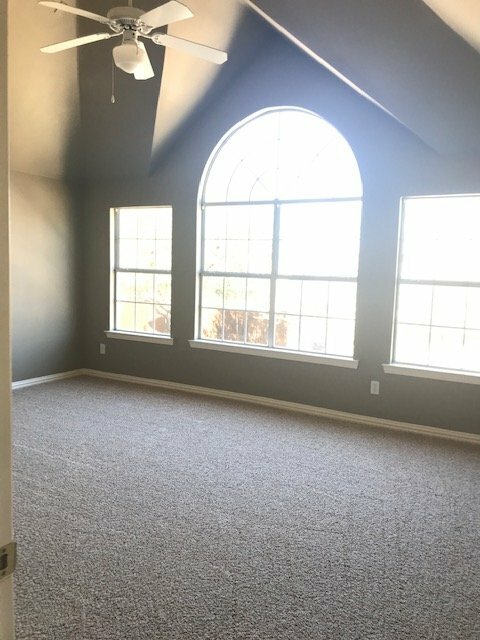 We love this room because of all of the natural light that it gets. Its rare that we ever have the overhead light on in here and just love how bright and airy it turned out. 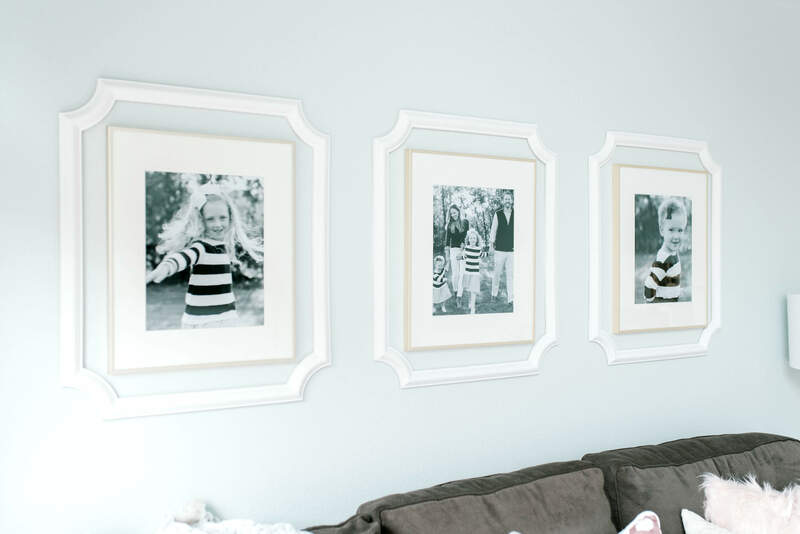 After photos are never quite as impactful unless you see the BEFORE images, right?! Even though I am awfully embarrassed of these, I think it’s necessary to show you how the room looked pre-move in and then how much of a dumping ground it became as we got settled. It’s mortifying and I cannot tell you how much MORE use we get out of it now that everything is organized and neat. Below is the image of how it looked pre-move in. Still bright but the dark mocha paint really made it feel less airy. Here’s how it looked upon moving in. It became that room during a move in that was quite literally the dumping ground for anything that didn’t have a home. Exercise bike?? Sure, put it in the playroom. Old sofa? Yep, the playroom. Countless toys, gadgets and oversized plastic contraptions?? Yes, the playroom of course! 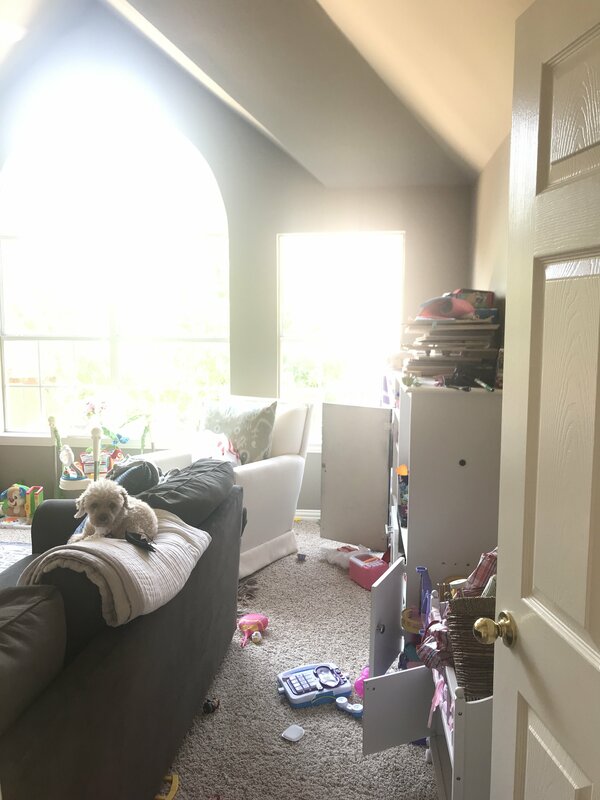 When we were finally moved in, it became overwhelming to even walk in there and was a less than desirable space for the girls to enjoy themselves. Nothing had a home, we had WAY more junk than we needed any we found ourselves literally shutting the door on the space and avoiding it like the plague. I was so overwhelmed with where to start that I had to call in the professionals on this one and I’m so so glad that I did! 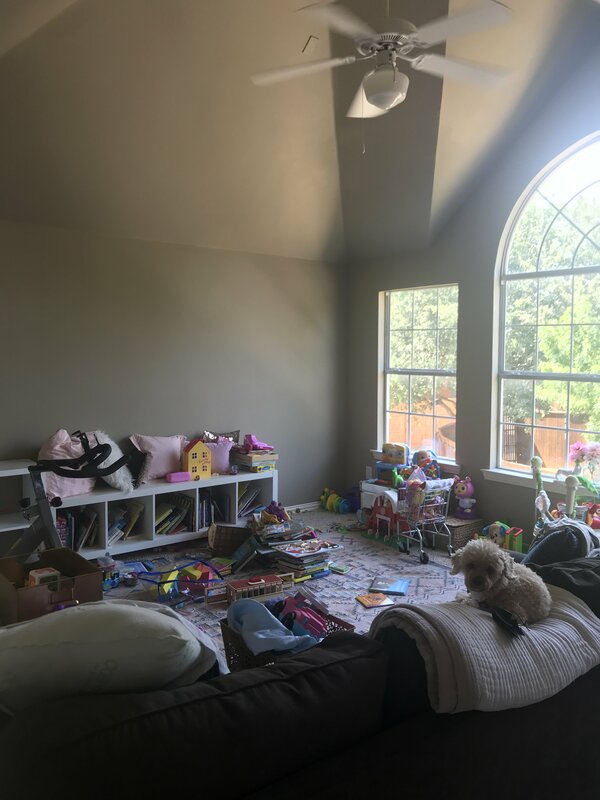 Katrina is going to go into details about her tips for organizing a playroom below, but as a part of the process we went through each and every toy together and separated them into DONATE and KEEP piles. We then scrubbed through the KEEP piles multiple more times, really thinking through if they used the toys or not. Overall we donated 6 huge bags of toys that the girls had either outgrown or simply didn’t play with. We got rid of any puzzles or toys that were missing pieces, anything that wasn’t age appropriate and any books that we didn’t enjoy. 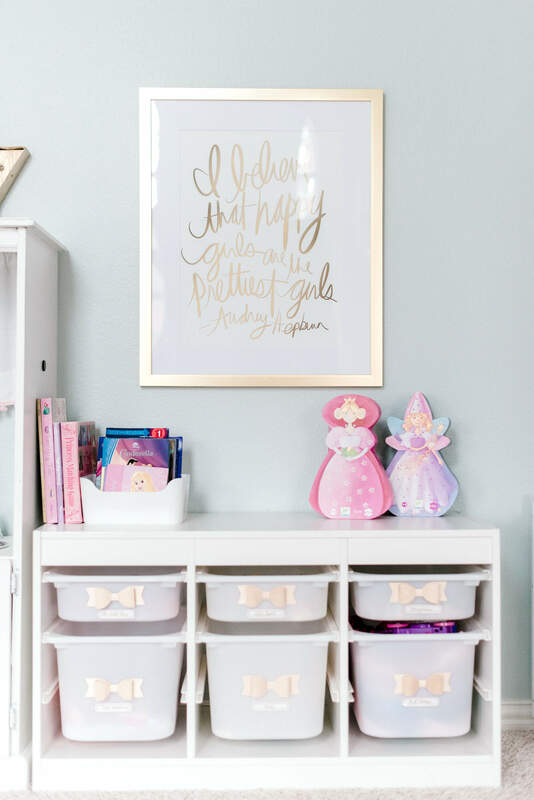 The process was very hard at first because I found that I really do have any emotional attachment to anything concerning the girls, but in the end it was so freeing and I love that their playroom is now so well curated. What I’ve learned is that less toys actually fosters better play. Who knew?! I knew that I wanted to use the far left wall to it’s fullest potential and that’s where I wanted to anchor the room with the TV and TONS of storage. Here’s the initial mockup of my vision and I’ll detail out how I pulled it together below. Here’s the finished product! Nearly every square inch of the wall has become usable space either for storage, entertainment or to add some light. It’s one of my absolute favorite scenes in our house at the moment. The good news is that it makes a huge impact but didn’t cost a total fortune and can probably translate into working for quite a few of your walls. I started with the TV and built out from there. 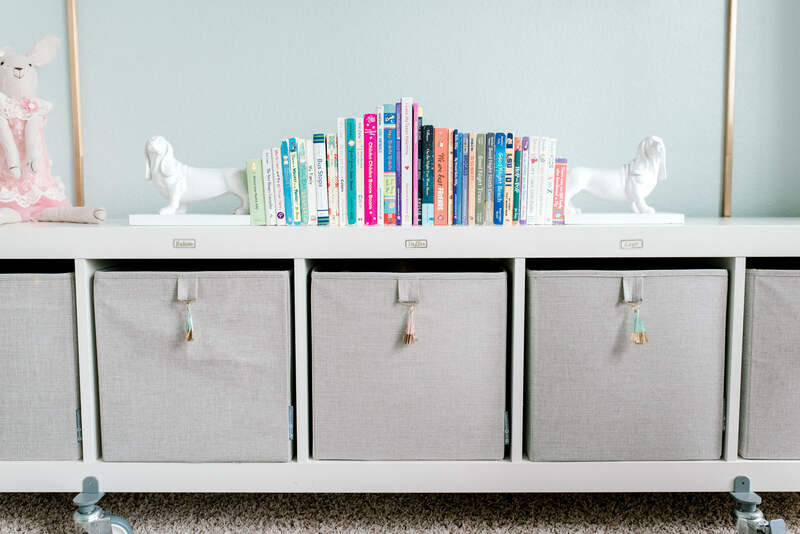 I already had the rolling bookcase (remember it from our Charlotte Playroom??) and it was perfect for under the TV. 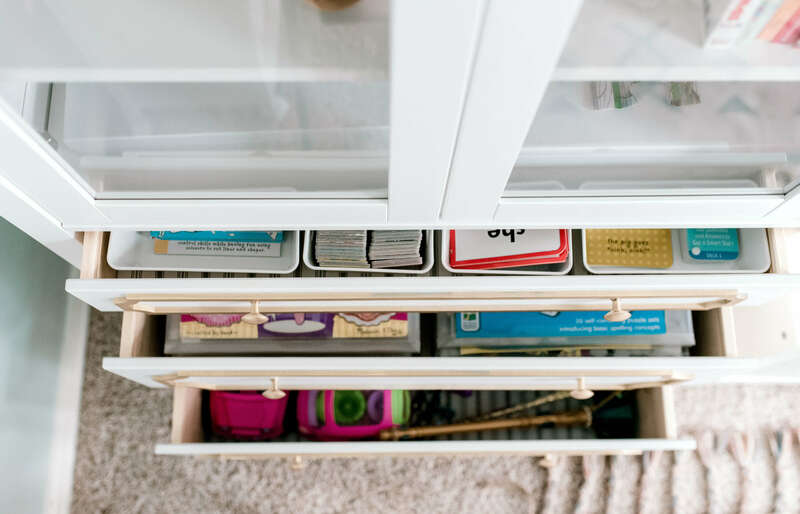 Each cubby has a functional and labeled basked (babies, stuffed animals, legos, books x2), so that it really helps with storage, but everything is neatly disguised. On top we displayed the books that we read most often and then I’ll periodically switch some in and out. From there I found the flanking cabinets from IKEA. I knew that the measurements were nearly perfect to fill out that wall and loved that they had drawer + cabinet storage along with the height to really anchor the wall. I also knew that I was going to immediately jazz them up with o’verlays! O’verlays are one of my absolute favorite brands. They create mouldings and panels that easily adhere to and totally transform furniture! They also have specific kits just for IKEA furniture and let me tell you, they make IKEA look like a million bucks! Remember THIS DRESSER? That’s when I fell in love with o’verlays. For both projects I painted the panels in the same gold spray paint and simply adhered them with nail glue. Here are the ones that I chose for these cabinets. To fill in the extra space I flanked the TV with beautiful and inexpensive sconces. They give beautiful light at night and I love how they add some depth to the wall. When finishing it out, I had a vision of moulding around them. I searched and searched and searched for what I was looking for and kept coming up empty handed. One day I was looking through Home Depot and came across these by total accident. I ordered them but secretly thought that they were too good to be true. I got them in and was so pleasantly surprised! The quality is awesome and they were so easy to adhere to the wall with liquid nails. They are under $15 HERE! Next up, I originally thought that I was going to get rid of the glider (originally in Landry’s room), but we we actually loved it in this corner. It’s a cozy reading spot and also a spot where Daddy likes to post up to play guitar. We also used the space behind the glider to hide some pretty big plastic toys, see below. On the left side of the room, we have the play kitchen (see this post for the DIY) and then we also got a nifty set of drawers from IKEA for storage. They house things like Little People, LOL Dolls, Baby accessories, etc. 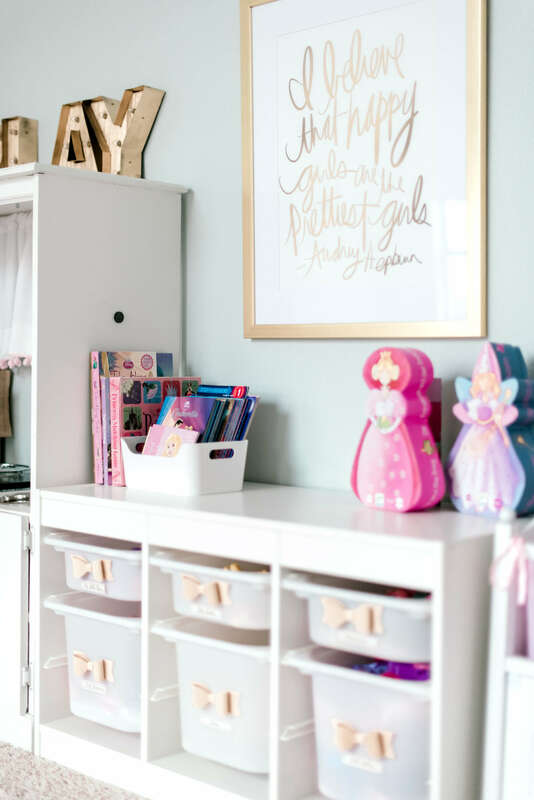 On top of it Katrina and her team created the cutest little Princess moment that gives off a cohesive and organized look. Instead of having the sofa in the middle of the room (what were we thinking?! ), we moved it to the back wall with the chaise along the windows. It fits PERFECTLY and I love how it totally opened up the room and also created an awesome place for us to land and snuggle. 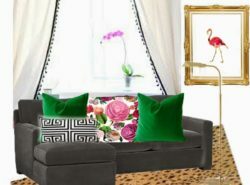 Above the sofa, I bought these inexpensive gold frames (that are awesome quality!!!) and used more moulding from that same brand that I got from Home Depot and added them to the frame display so that it took up more room on that large wall. For quite a bit of the room design, we used what we already had on hand and thankfully it all pulled together. I knew that I wanted the rug to stay and kept it top of mind as this design came through. 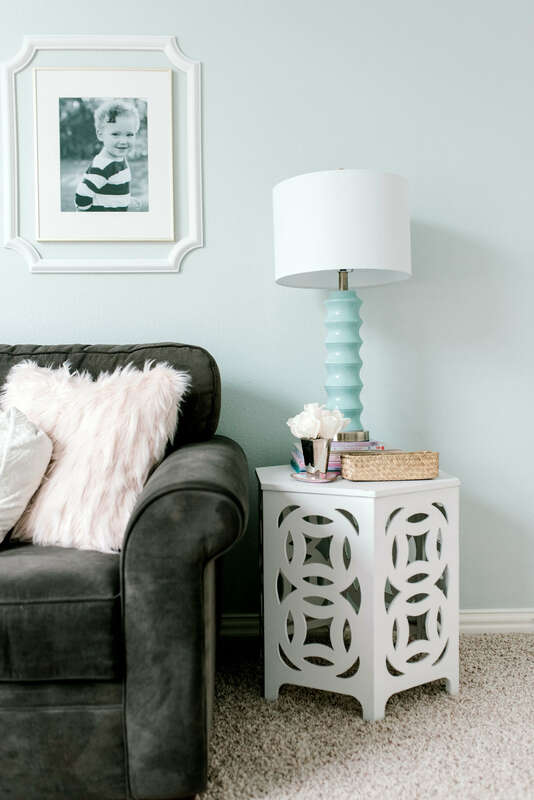 It was the anchor to our previous playroom as well and I still have yet to grow tired of the colors or pattern. It’s sophisticated yet still playful and this time I chose to bring out more of the blues in it for this room. This little table was also in our previous playroom and I cannot tell you how much use we get out of this thing! 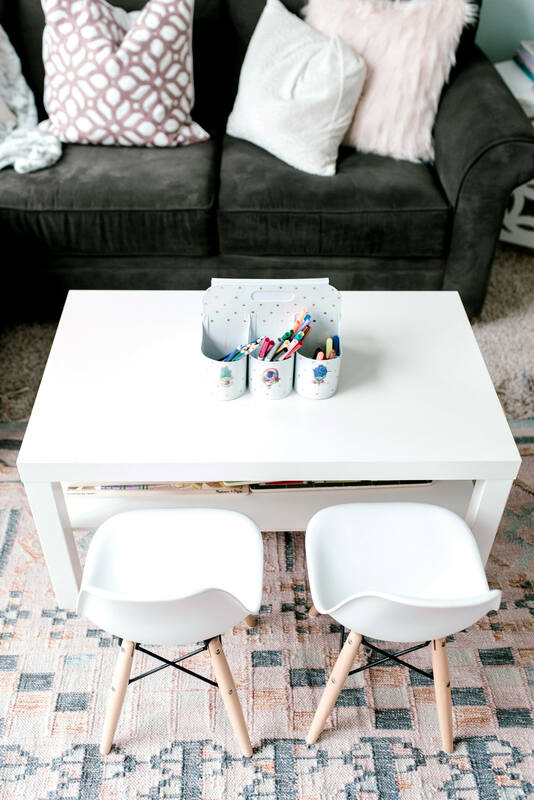 It’s a $25 coffee table from IKEA that we use as a coffee table in here and as a mini craft and coloring table for the girls. One of them is always sitting here playing something and we love it. Also if you need playroom or kids table chairs, we cannot recommend these enough! 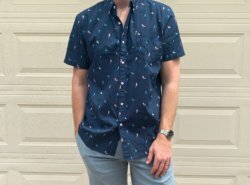 The price is awesome and the style is on point. Love how this wall turned out! I linked the exact sizes that we have in each so that you can get a feel for scale. Dan made this play kitchen our of an old entertainment center for Landry for her first birthday. The post about it is HERE and it’s one of the first DIY posts that I had done on the blog. Looking back at that post and baby Landry makes me weepy. It’s funny to see how the decor of the little kitchen has shifted with our decor. The girls just love it and Katrina did such a great job organizing it! –Space for your children to play is more valuable to their development than having tons of toys. Think about keeping more open-ended toys instead of toys that just have one way of playing with them. –Work with the space you have. Whether it’s a small apartment or a 4 bedroom house, create a system that works for the home you have now. Waiting for the perfect time or perfect living situation only adds more stress to day-to-day life. –Declutter regularly. Children are better at getting rid of toys that we give them credit for. The trick is to start early and be consistent. We declutter the toys every two a months. Start with the easy clutter like birthday party favors and broken pieces. Work your way up to stuffed animals, dogs and LEGO. If your child is having a hard time you can motivate them by saying that we only bring in new when we pass on used. Follow Katrina on Instagram HERE for helpful everyday organization tips! -Keep board puzzles organized with clear plastic file folders. This way the piece don’t get lost while still being able to see the puzzle. They also stack better. The ones we used are HERE. 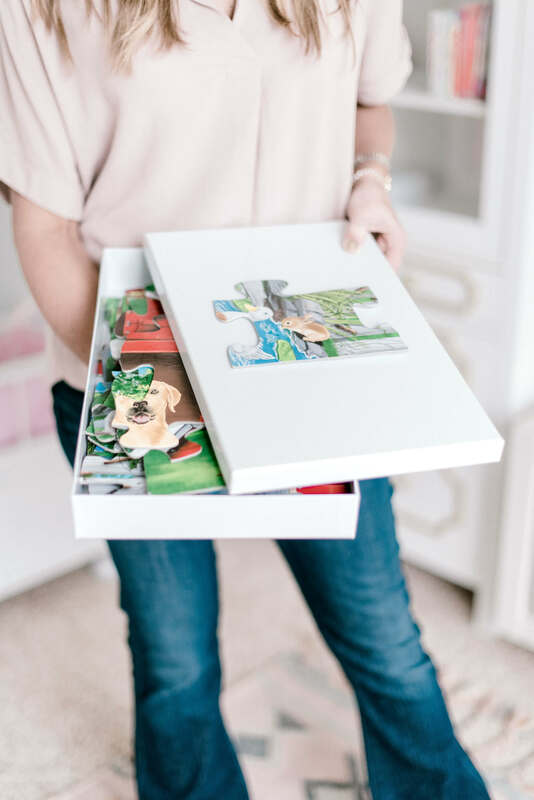 -Create a more uniform look for larger jigsaw puzzles by storing them in matching gift boxes like these from The Container Store. To tell which puzzles are which secure one the puzzle pieces to the front or top of the plain box with a 3M Velcro strip. That way you can pull it on and off when you build the puzzle. We used THESE. -The old saying “A Place for Everything and Everything in Its Place” still is so true! It is actually the key to maintaining order. When you take the time to sort, separate store toys children will know where to put items away. 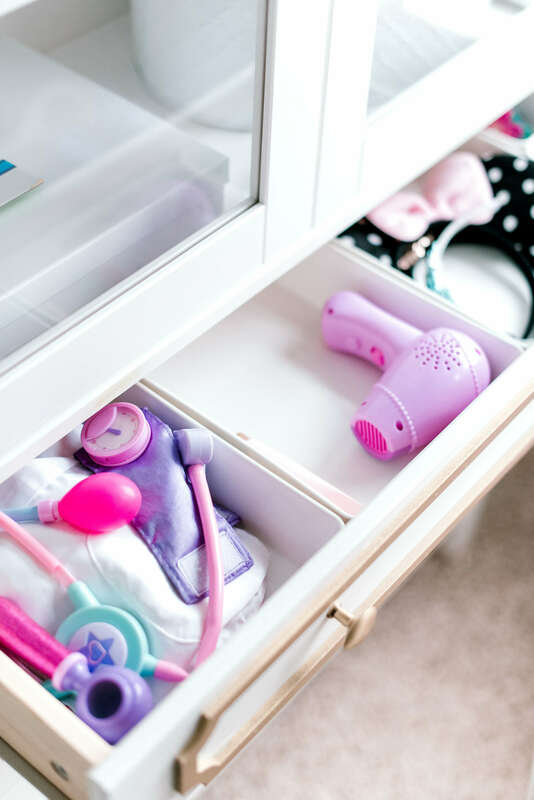 The the best way to insure toys staying organized is to set up house rules. At our house we don’t have more that three categories of toys out at one time. We also clean up before leaving the space. Another tip is to take photos with you smart phone of the organized spaces after you reorganized and print the photos from an app I use called Cluster. 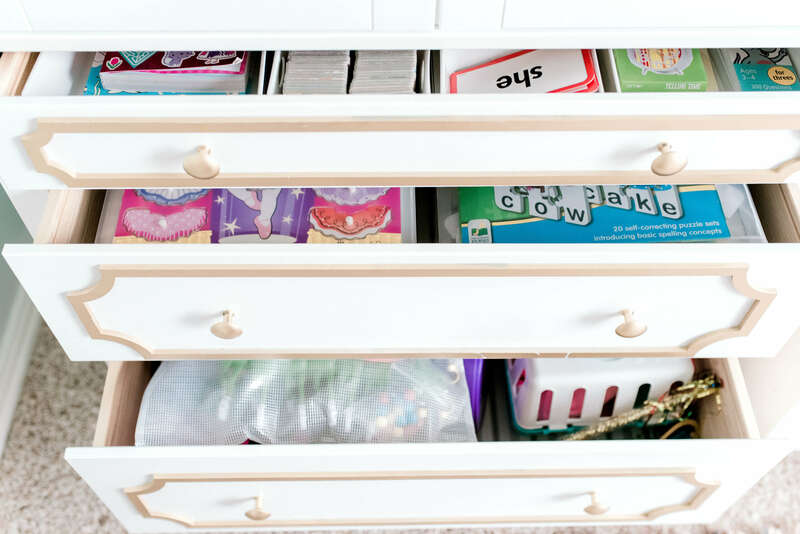 You can actually tape the photos of your organized toy bins and shelves to the wall or inside a cabinet for kids to reference how things should look when cleaning is done. 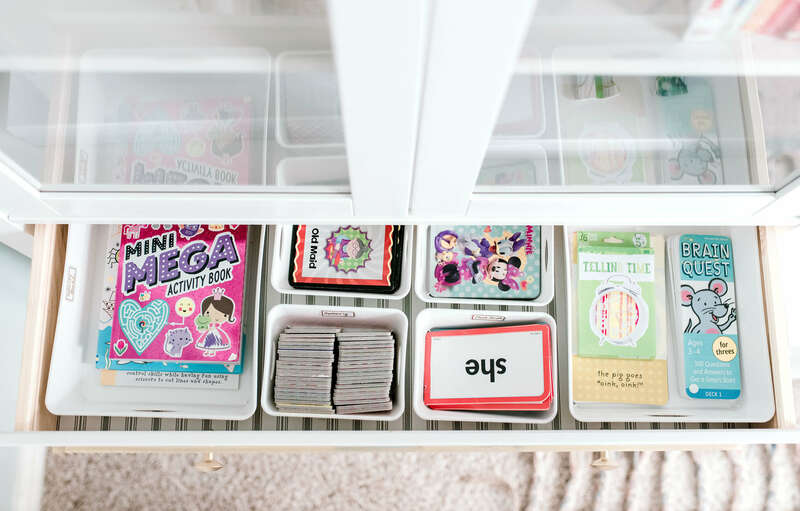 ​Katrina put these drawers to max use by using small divider bins for smaller cards, games and flashcards. Now every single thing has a place and Landry can easily take over the cleanup because she knows the home for everything. In the other cabinet, Katrina used the drawers to completely organize and separate our dress up wardrobe. Every single piece has a home and it’s glorious. 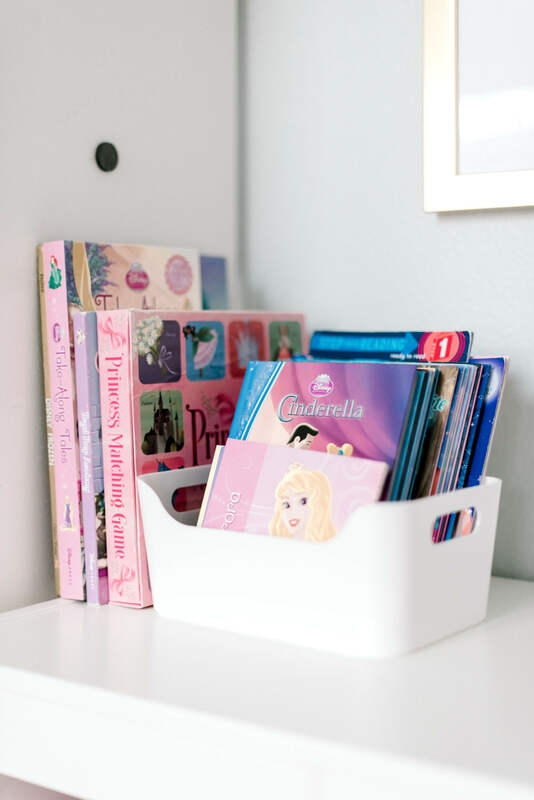 Obviously, the organization needs vary based on your child’s preferences and age, but that’s why I really liked having an outsider come in and look at our toys differently. She was able to pick out what we had a lot of and what the girls really liked and we focused on those things. –What about all the big plastic toys that don’t fit into bins? In a perfect world these would not enter my house, but my kids must be kids and they do love certain large toys. 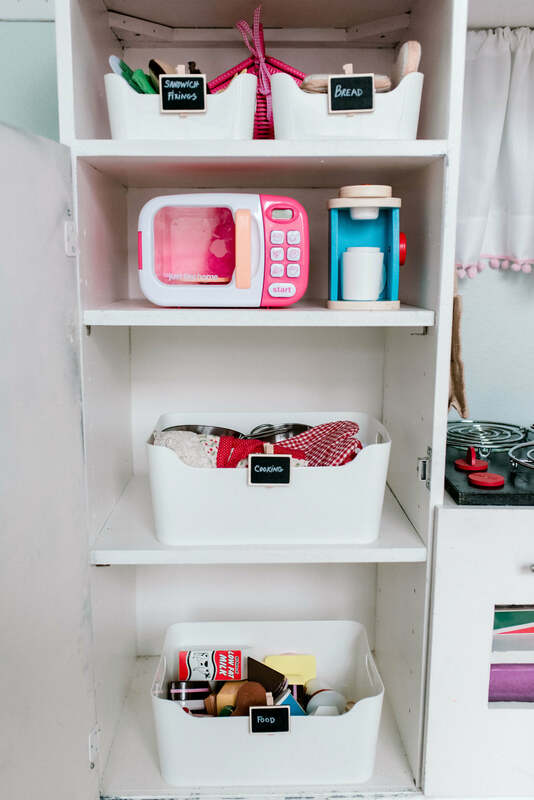 If you get creative you can find places to store bulky items like animal barns and doll houses. Could you create a nook in a closet for the dollhouse to be accessible? 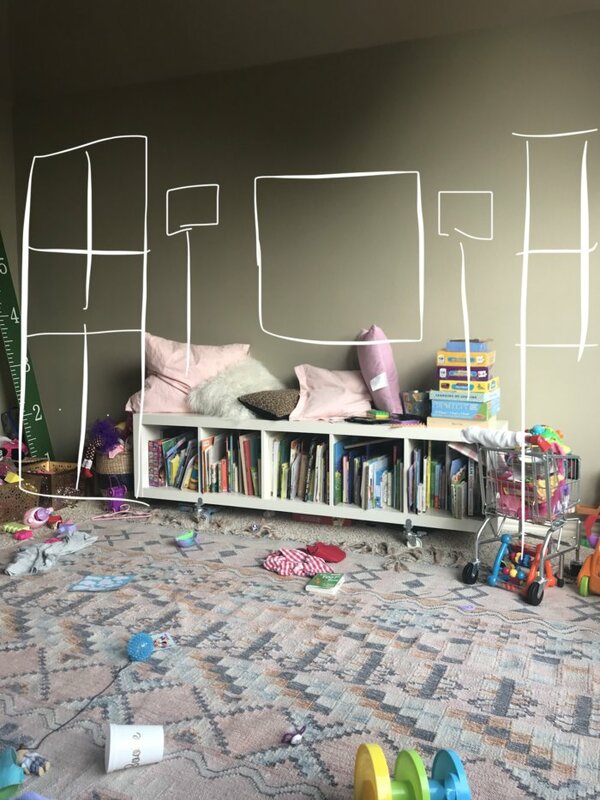 Could a large basket of bulky toys be stored behind a chair pulled away from the wall? …remember when I said earlier that I was glad that we kept the chair in the room? Well, here’s a prime reason why. It conveniently hides ​all of the bulky Little People houses behind it. They are still accessible, but hide away nicely for a really clean look. This XXL basket from Amazon was the perfect container for them and I simply pull it out when they’d like to play Little People. Even though it seems silly, even the remote basket has proven functional. Both girls know that the remotes belong there and it makes a world of difference in how easy it is to find them always. We used THIS little basket set. Here’s one last look at the entire room! It was a joy to put together and it’s made a world of difference to have a beautiful and functional space for the girls to play and for the family to gather. I couldn’t have done it without Katrina and her team and I really appreciated the organization process from start to finish. If you are feeling overwhelmed by a space and don’t know where to start, I promise you that hiring in the professionals is an investment you won’t regret. Contact them HERE. If you like all things organization, you’d also really like to follow Katrina and Team on Instagram HERE. Bins + See tons of other options that fit within IKEA cubes HERE. 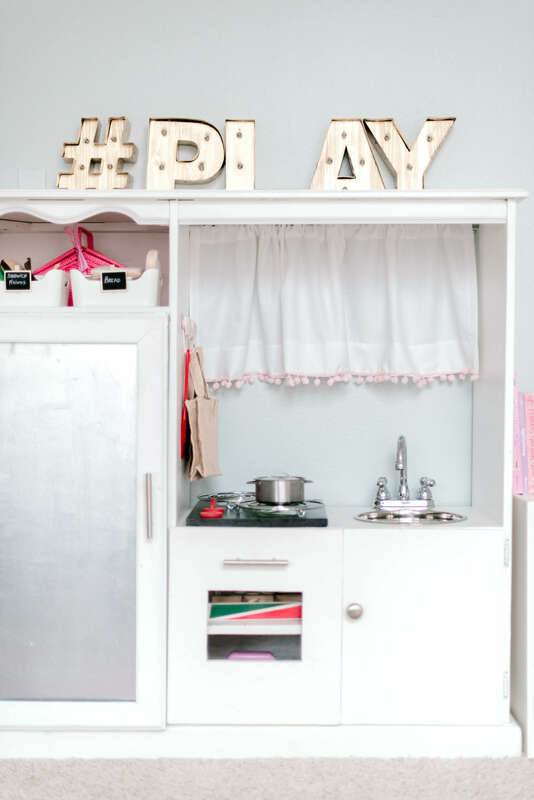 To see our other playroom, check out THIS post! What size are the boxes you used to store puzzles? I think that is a great idea for my Kindergarten classroom. Our puzzle boxes are falling apart. 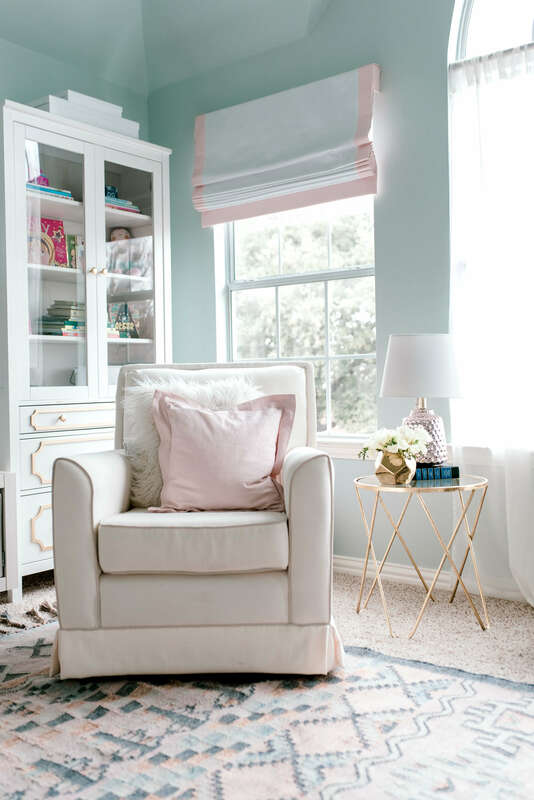 Mallory – this room turned out GORG. Completely obsessed! Hi Mallory, absolutely love the room!! Where did you cute the adorable bows on the Ikea drawer system? I looked on the overlay’s website but didn’t see anything like it. Would love those to our system in the playroom. Thank you!! This is beautiful! 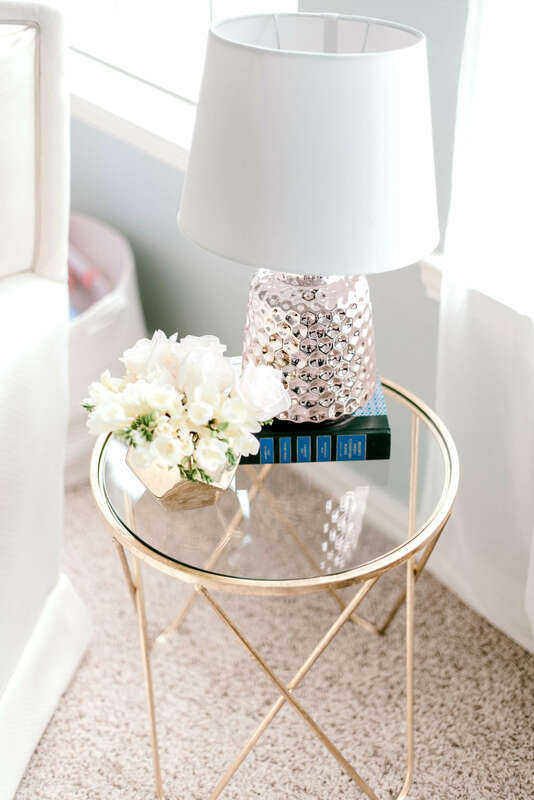 Where did you get the gold side table next to the glider? You are so talented, friend! Love the room! Where did you get the bows for the Ikea storage drawers? Great idea!